At the bottom of every Negotiate 1-2-3 learning module is a list of Related Modules. These may be in the same or a complelely different unit ("Openings," "Critical Moments," "Closing." You may find that rather than proceeding through the Negotiate 1-2-3 learning modules in a linear way, you'd like to follow particular themes or topics of special interest. 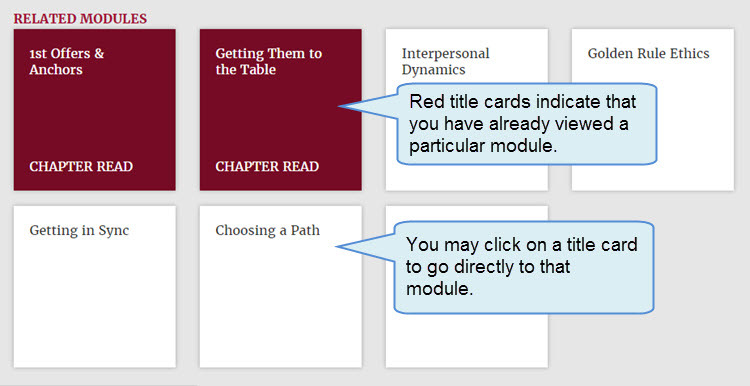 The Related Modules section can assist you in developing your own customized learning experience. Users are encouraged to post comments on the individual learning modules of the site. 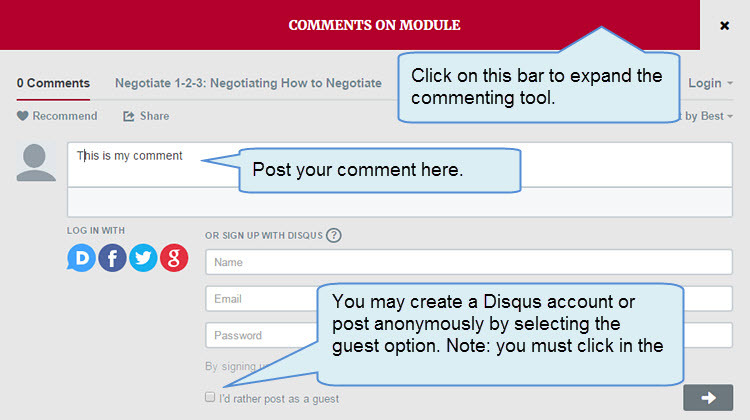 You may sign up for a Disqus account, login with your social media username/password, or post anonymously (see instructions below). A the bottom of every learning module is a list of Additional Resources (books, articles, videos, blog posts, etc.) for users interested in digging deeper into a particular negotiation topic. These resources have been curated, tagged, and added to a searchable/browseable repository called the Article Database. The Glossary page provides some key definitions for negotiation-related terms used on this website. The source of the definition is provided, as well as links to the online resource. We encourage our users to fill out our feedback survey to help us continue to improve this learning experience.